Founded in 2017, and operated by White Hat Gaming Limited, Slot Planet is fast becoming a major online casino in the European gaming market. 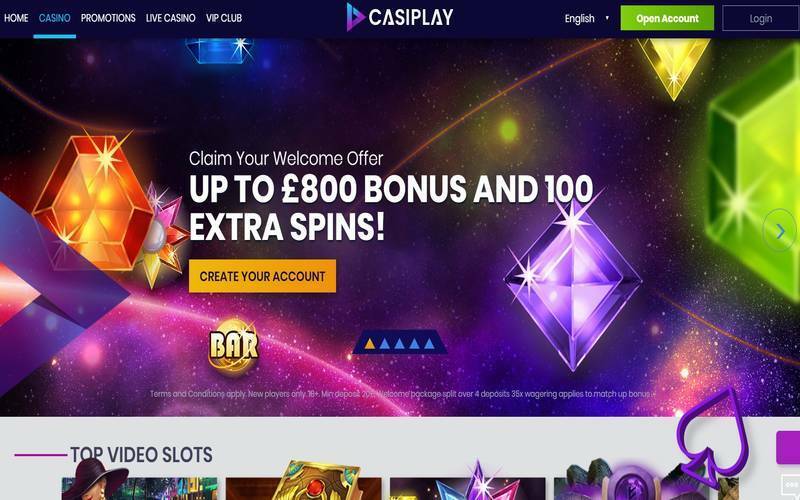 Licensed by both the Malta Gaming Authority and the UK Gambling Commission, the site has established itself as a trustworthy site. Slot Planet offers more than 502 slots on their desktop site, and 422 on their mobile platform. The site offers slots from all the major software providers, including Red Tiger Gaming, ELK Studios, Scientific Games, WMS, Bally, Nyx, Foxium, and Games Werehouse. Along with hundreds of popular and classic slots games, Slot Planet also has several live dealers games available for play. These include Baccarat, Blackjack, Keno, and Roulette. 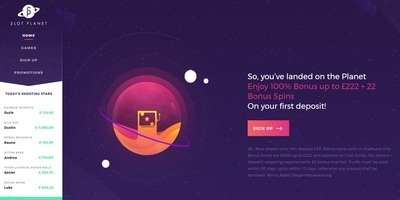 Slot Planets offers all the major online payment options (except for PayPal). Slot Planet promises (and delivers) secure payment processing, using the latest, greatest SSL encryption methods. Slot Planet offers the following deposit options: Giropay, Mastercard, Maestro, Paysafecard, Sofort, and Trustly. Withdrawal options on Slot Planet include Giropay, Mastercard, Maestro, Paysafecard, Sofort, and Trustly. There are no withdrawal limits, but transactions may take 3 days to fully process. Slot Planet currently offers a 100% first deposit bonus (up to £555). You must wager 35x times your bonus in order to withdrawal the bonus amount. Other terms and conditions for the Slot Planet first deposit bonus include: £5 per bet limit with bonus funds. The bonus must be used within the first 30 days of your account before the unused bonus amount will expire. Slot Planet has a mobile enabled version of its desktop website, allowing you to play on the platform on your phone without having to download an app. The Slot Planet mobile-enabled website is available for play on both the Android and iOS (Apple) platforms. Slot Planet offers both email and IM (Live Chat) support. This is a strong positive of the site, as issues with the platform can be immediately resolved. Slot Planet’s customer support is available from 10am to Midnight weekdays, and 6pm to Midnight on weekends. With a generous first deposit bonus and a wide variety of games, Slot Planet is a solid choice for the European slots players. With live support available with any issues with your account, problems common with online casino platforms can be easily resolved. One strong negative of the site, however, is the lack of a PayPal deposit or withdrawal option. While all the other major European casino deposit/withdrawal providers are available, it is notable PayPal is not available. The lag time for withdrawals is also a concern. 72 hours is not “slow pay” by any means, but compared to other major slots casino websites, this is a slow payout time. All in all, Slot Planet offers a solid option for the European online casino player. 18+. New players only. Minimum deposit of £20. Bonus funds are 100% up to £222 and separate to Cash funds. 35x (bonus + deposit) wagering requirements. £5 max bet with bonus. Bonus must be used within 30 days otherwise any unused bonus shall be removed. Terms Apply . BeGambleAware.